My first post-Christmas review...hurrah! And in typical fashion it's for something healthy, which is just what the doctor ordered after all the rich food and sweets over the festive season. 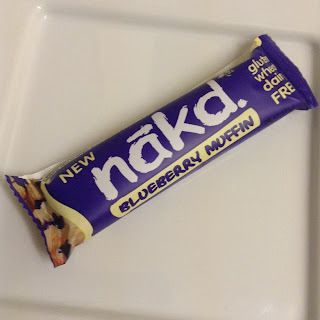 This new Blueberry Muffin flavour Nakd bar caught my eye in a local Sainsbury's Express only a few days after Christmas, and being a huge fan of their other varieties it went straight into my basket. How would it compare to previous editions like Lemon Drizzle and Carrot Cake? The bar cost 85p and consists of a mixture of dates, cashews, raisins, almonds, blueberries and a hint of natural flavouring. Opening the wrapper it had a super strong blueberry aroma - wow it smelled like a blueberry muffin alright! 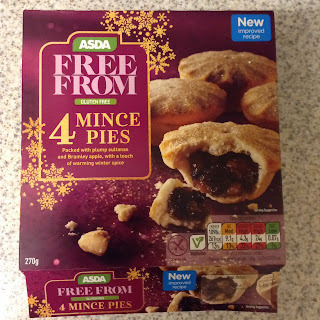 I reviewed Asda's Free From Mince Pies last year, but this year they have only gone and bloomin' improved them (again), so here I am reviewing the new and improved versions. The things I do for food research haha! It's always nice to have more gluten free varieties, and thankfully all the supermarkets are expanding their options all the time - with even Aldi currently doing Gluten Free Mince Pies and Christmas Puddings. It's a step in the right direction for us gluten free folk for sure. I do enjoy Asda's offering, in fact I'd say they're the best budget gluten free mince pies around. Free from Dairy and Gluten, but sadly not egg these aren't suitable for vegans. And despite the lack of butter, the pastry on these still tastes lovely and buttery, melt in the mouth and has just the right thickness. Taking a break from the indulgent foods this festive season, today we have a healthier product, Twinings Cranberry & Blood Orange Herbal tea. This is the perfect drink for the festive season, and a nice way to warm up without loads of calories. I found these teabags in Poundland but most supermarkets stock them I believe. They taste as you would exspect, warming tart cranberry with the sweeter, punchy blood orange, making for a great combination. I added some stevia to mine as I always do with hot drinks, for a hint of sweetness without the calories. I'm constantly sipping on this stuff in these Winter months, it's such a treat in the mornings especially! Also good when trying to watch your caffeine intake before bedtime. Overall, I would highly recommend this Twinings tea, they do a great range in general but this one is particularly suited to the Winter months! 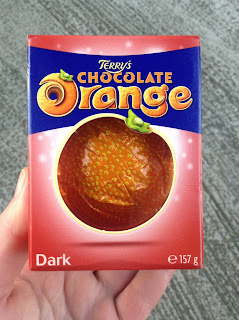 Since my last review was for the poor quality Terry's Dark Chocolate Orange, I thought I'd brighten things up and spread some festive joy by reviewing a much better quality orangey chocolate - and not just any orangey chocolate - Marks and Spencer's Dark Chocolate with Clementine! 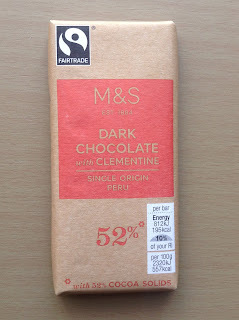 Yes, regular old oranges are not posh enough for M&S and they've flavoured their bar with clementine instead, so how does it fare? I've had this in the archives for a while now, just waiting to be reviewed, and what better time than the festive season? This is a single origin Peru dark chocolate with 52% cocoa solids, blended with clementine oil. A bit different from the usual orange oil found in most orange dark chocolates! The bar I bought was in the mini 35g range for around 80p, although you can buy larger 100g bars for £2. 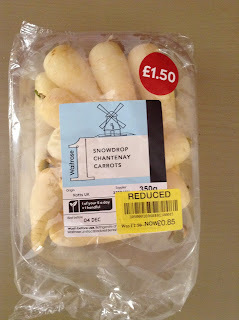 Taking a break from the constant deluge of sugary treats this festive season, I've decided to review something a little more normal but still fitting for Christmas and the snowy weather - snowdrop carrots! No, these are not parsnips despite looking like them, they are actually carrots and taste like carrots. So what's the difference between these white versus orange carrots? And are they just parsnip-carrot wannabes? I bought these from Waitrose, reduced to 85p from £1.50. I peeled, boiled and chopped them as you would regular carrots. Taking a bite of a slice before cooking, I was subconsciously expecting the taste of a parsnip...but they tasted just like a carrot, albeit slightly sweeter and lighter. 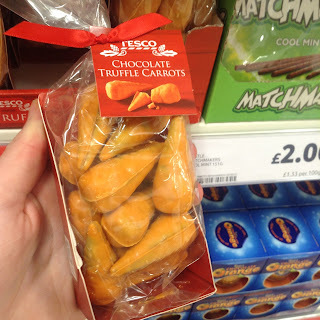 They didn't seem as "heavy" tasting as regular carrots is the best way I can describe them! The big day isn't far away and the festive treats are flowing...well, they are if you review snacks anyway! Marks & Spencer have been leading the pack this year in terms of interesting Christmas foods, from the likes of Milk Chocolate Cinnamon Tortillas, Prosecco Caramels and even a Christmas Pudding Smoothie. For more do check out my Instagram page (there's updates daily!). 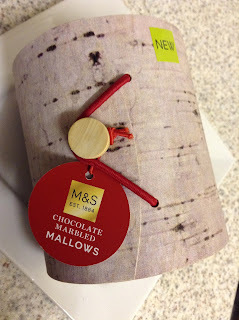 They're described as "vanilla mallow with marbled dark chocolate" and come in a fancy wooden tube style box, which you peel open to reveal a bag of mallow chunks. They certainly looked super squishy and bouncy, with a nice chocolatey swirled effect going on. Plus there was the obligatory dusting of icing sugar. 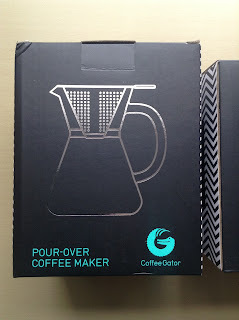 One of the products I was sent is The CoffeeGator Coffee Canister, a swish metal canister designed to keep your coffee super fresh as though the packet has just been opened. This is achieved with a special valve in the lid, which allows C02 to leave the canister but stops air and light getting in and affecting the flavour. It definitely keeps the coffee tasting fresher for longer, with no more having to clip pegs onto packets like I used to do! 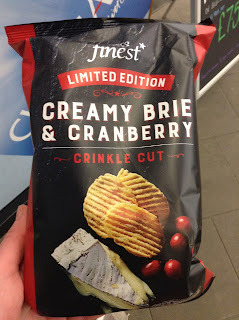 For £1 a bag these are described simply as "Brie and cranberry flavour crinkle cut potato crisps". Opening the bag they certainly had a super strong cheesy aroma. They tasted super cheesy indeed, as you would expect from brie flavoured crisps! It was quite overpowering - these definitely aren't for the faint of heart and are clearly only for those who truly love their cheese. The cranberry flavor adds a slight sour tartness, it's subtle but you can (just) taste it amongst all the cheese. I do often bemoan the quality of Cadbury's chocolate, and with good reason - the taste and texture has gone way downhill in recent years. However I am still human and love most things sweet so when offered to try the Cadbury Christmas range I didn't say no. Their 2017 products include a few newbies in their stocking fillers, including Cadbury Dairy Milk Freddo Faces. I was sent those along with Cadbury Dairy Milk Buttons so thought I'd do a head to head comparison of the two! Starting with the Freddo Faces these aren't all in one tube but rather in little packets inside the tubes, which is disappointing. It doesn't feel special but rather that they've just stuffed some regular products into a tube and given it a festive label. Still it makes them handy to give out as snacks and keeps them fresher. Well, in theory it does if you don't intend on eating them all at once!